Passez une journée à explorer la charmante ville de Séville lors d’une visite guidée de l’Algarve. La capitale de la région espagnole d’Andalousie est le cœur de la danse flamenco et regorge de monuments et d’attractions fantastiques. Pendant le circuit, découvrez le magnifique parc Maria Luisa situé à côté de la Plaza de España. Ensuite, voyez le palais de l'Alcazar et la cathédrale de Séville, la plus grande église gothique du monde. En compagnie de votre guide expérimenté, découvrez l’histoire et la culture tout en traversant le quartier de Santa Cruz. De plus, vous aurez 3 heures de temps libre pour explorer Séville et en découvrir davantage! Explorez Séville en marchant et découvrez les principales attractions de la ville, telles que la cathédrale de Séville et le palais du Real Alcazar. Après avoir rencontré votre guide à votre hôtel de l’Algarve, partez pour une excursion d’une journée au joyau andalou d’Espagne, Séville. À bord de votre autocar climatisé, profitez de vues tranquilles lorsque vous voyagez à l'est de 2 heures. Après votre arrivée, aventurez-vous à pied pour découvrir les principales attractions de la ville. Tout d'abord, promenez-vous dans le magnifique parc Maria Luisa, un parc public bourdonnant de pique-niqueurs locaux et ombragé par un dais de palmiers, d'ormes et de pins méditerranéens. Promenez-vous dans les vastes jardins de style mauresque du parc en vous approchant de la magnifique Plaza de España. Découvrez comment cet édifice de style Renaissance a été construit en 1928 pour l’exposition universelle ibéro-américaine. 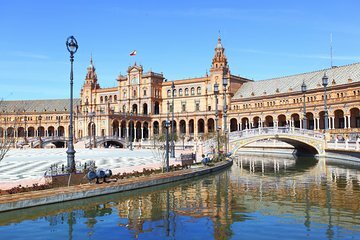 Entrez dans la majestueuse Plaza de España en remarquant le fossé en demi-cercle, les ponts piétonniers grandioses et les magnifiques tours jumelles. Dirigez-vous vers le centre et voyez la fontaine Vicente Traver. Regardez l'eau monter dans les airs en créant un brouillard rafraîchissant. Avancez pour explorer le quartier de Santa Cruz. Apprenez-en plus sur cet ancien quartier juif en vous promenant dans des ruelles pavées étroites de bars à tapas. Après avoir erré dans de charmantes maisons blanchies à la chaux, vous arriverez à la cathédrale de Séville, site classé au patrimoine mondial de l'UNESCO. Arrêtez-vous pour une séance photo parfaite dans la plus grande cathédrale gothique du monde. Ensuite, dirigez-vous vers le Real Alcazar Palace (Alcazar de Séville), le plus ancien palais royal encore utilisé aujourd'hui. Admirez son architecture développée par de vrais rois maures et découvrez comment les étages supérieurs sont toujours occupés par la famille royale. Après la visite du palais, votre visite se termine avec votre guide, mais continuez vous-même pendant les 3 prochaines heures. Si vous avez faim, dirigez-vous vers un bar à tapas pour savourer une grande variété de bouchées savoureuses ou prenez une glace fraîche pour refroidir (à vos frais). Peut-être entrer dans une boutique de souvenirs ou simplement errer dans les couloirs en profitant de l'ambiance. Après trois heures, rendez-vous avec votre guide à un endroit et à une heure convenus et revenez à votre hôtel en Algarve, où votre journée de travail se termine. Our group of 4 friends took this day trip to Seville on March 6, 2019 and it was just as explained in the write up Bus picked us up promptly at the time and place by our hotel in Albufeira and the day went off without a hitch. The guide gave a running commentary about the countryside we were passing through all the way to Seville which was appreciated. Had a rest stop on the way there and back for washroom break and quick bite , did a tour around part of Seville on the bus once there and then were let off for exploring..the guide took the group along to the plaza near the cathedral and gave some recommendations on where to go if we were heading out on our own or you could stay with her if desired. Our group went off on our own and had no problem finding our way around the immediate area and the guide had stressed the landmarks to look for to find our way back to the meeting point. Would recommend this tour. Fantastic trip, excellent value for money, we were picked up from Quarteira at 5.45am on the dot and collected several other parties of mixed nationalities and crossed the border into Spain at about 8.45am. We stopped for half an hour at a cafe, we always bring something with us to eat so that one of us can get a table and the other can use the washroom, by then the line for drinks has shortened and you can take a few minutes to relax. Another 90 minutes and we were in Seville, Carlos the multilingual guide was superb at explaining the fascinating history of the city and Constantinople the driver was brilliant at negotiating the very busy traffic while we went on a trip around some of the main points of interest. We then disembarked and Carlos took us on a short walking tour to the Cathedral, suggesting we could take an optional boat trip on the Guadalcivir an hour before departing, which we did. We then set off to check out the main sights, in particular La Placa we Espana and the bullring which we had come specifically to see...stunning. Back on to the bus for a three hour journey back to Quarteira with drop offs for all guests. What a fantastic day, ignore the grumblers who complain about the journey time, if you are lucky enough to be able to travel be grateful..We priced a return private taxi to Seville and it was 250 euros, so the cost of this whole day was just a fraction of that, and worth every euro. Thanks to everyone involved at Viator, Destinations Travel Solutions and Follow Me Tours for an unforgettable day. Our tour guide Ana from Follow Me Tours was fantastic. Very clear instructions, friendly, and great to listen to on the bus. It is a long day depending where you get picked up from but you get plenty of time in Seville so it's worth it! My Only Complaint Is That Although Viator Say Hotel Pickup Is offered it doesn't include all hotels and since pickup was at 6am found myself walking in the dark with not a sole around and would definitely not do that again. Also the pickup location was the bus stop NEAR casa inglesa restaurant not the parking lot infront of it as the confirmation email suggests. Thank to Ana for shouting out to me when she could see me standing in the wrong location in the dark. The tour itself is really something you do yourself when you arrive. The guide gives you plenty of places of interest to visit and there is sufficient time to do the main attractions and make it back to the Algarve. I think personally the group was too big and personally prefer a smaller group. We were staying in Portimao and were picked up and dropped off at our hotel which was great but, it was a long drive picking up people along the way, it took 4 hours to get to Seville with one stop for half an hour. Guide was OK, we had a short drive round the historical area then the guide took us to where we could go in to places of interest, that took about 15 mins then left to our own devices for 3 hours, met back up with guide to show us where to get on the boat for a river trip, if you wanted, 1 hour. Then back on the bus same half hour stop on the way back, return journey took four and a half hours, three and a half without a stop. There were more drop offs than pick ups and therefor took longer. We ended being the last off, although we were not first on, only because it was where the driver lived. Seville is a nice place but the journey was too long. Like the Algarve-Lisbon trip we did with Viator, I found this trip to be good value for transportation to/from Seville in a comfortable setting, but not very good in terms of the guided tour. Most of the time in Seville was free time. The tour guide part happened entirely in the beginning as we entered the city, although she did do a brief walk when we arrived and provided an idea of how to tour the central area on our own. Be aware that the guided part of the tour is only in the first 30 minutes driving into and arriving in the city. Also, the tour guide was pointing out the sites in THREE languages and jumping between the languages each sentence. I was very impressed with her language skills but basically couldn't understand most of what she was saying as each sentence was repeated quickly in THREE languages so it was hard to focus on the actual substance of the explanation other than you are at the cathedral, etc. As with the Lisbon tour, Viator should really endeavor to provide one language per group rather than trying to cram in as many people on a multi-language bus as possible cool for meeting people but terrible for trying to fit a lot of sightseeing into one day. I would recommend this tour for a family wanting convenient inexpensive transfer to/from Seville. Read up and prepare yourself ahead of time for the things you want to see so you don't waste time trying to orient yourself once the tourguide disappears 30 minutes after you get off the bus. Having said that, Seville is unbelievably beautiful and not to be missed so go there if you can! Very good we enjoyed and Celia our guide is good I can recommend this trip will worth it value for money. We were a bit disappointed with the trip overall. When we booked the date - Wednesday 28th March for our day in Seville we were not aware that because in effect it was Ash Wednesday and the Religious significance it would affect our visit. There were SO MANY people wanting to get into the Cathedral, Palaces and attractions it was impossible to visit more than one and then the queuing was for almost 2 hours! All of the museums, places and attractions were closing at 2pm because of parades and celebrations that were starting at 4pm. It also meant our coach was to leave at 3pm so we did not get caught up in traffic. Our guide was very helpful, the coach was excellent but the fact we could see very little was disappointing. If we had known of the restricted opening times making queues so big and our limited time in Seville we would have chosen a different date. Seville is beautiful and the trip did serve as a 'taster' maybe for a weekend break at a quieter time! An absolutely beautiful city, an excellent tour guide Ana and a very comfortable bus. The booking and pick-up arrangements went very smoothly.